We all know that smoking carries huge health risks. The likelihood of developing chronic obstructive pulmonary disease (COPD), heart disease and stroke, not to mention cancer, are all massively increased by tobacco smoke wreaking havoc inside your body. Many of these issues can take some time to develop to the point where alarm bells start ringing. Some may never become visible. However, smoking also has harmful effects on your appearance. And this is something that is very hard to conceal. To help you along your stop smoking journey, Nicotinell, experts on how to stop smoking tell us about some of the ways that smoking will affect your appearance and why it’s time for us to kick the habit. Smoking lessens the amount of oxygen and nutrients that benefit your skin. The effect is that your skin will begin to age more rapidly and develop a grey and dull appearance. Premature ageing of your skin by between 10 and 20 years will also result from smoking. Nicotine causes vasoconstriction – a condition that sees blood vessels being narrowed and oxygen-rich blood flow to the tiny vessels found around your face and other parts of your body reducing. Vasoconstriction will also be very visible you suffer a wound as your skin will take it longer to heal. Scars will seem larger and redder than those who aren’t affected by the condition. 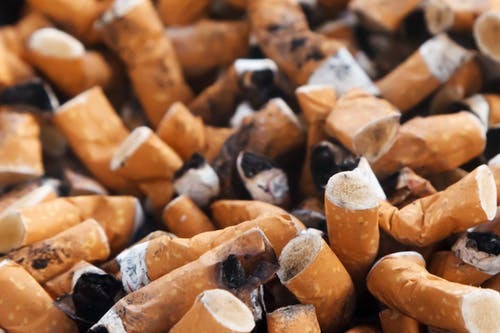 Many of the 4,000 chemicals found in tobacco smoke will also cause the destruction of elastin and collagen in the body. These are critical fibres which give skin its strength and elasticity. When they degenerate, skin begins to sag and deeper wrinkles start to appear. These will be particularly visible around the inner arms, breasts and face. Smoking will also precipitate a smoker’s pucker, caused by the use of certain muscles around the lips which cause highly visible wrinkles to appear. Together with a loss of elasticity to the skin, the ramifications on appearance will be obvious to all who see the deep lines around a smoker’s lips. You’ve almost certainly heard of crow’s feet – little wrinkles around the eyes that we all eventually develop. But these wrinkles start to become visible earlier and deeper when you smoke because of the heat from lit cigarettes and you squinting in order to keep smoke out of their eyes. Another common symptom is bags under your eyes. A study conducted by Johns Hopkins University School of Medicine in Baltimore suggests that those who smoke cigarettes are four times more likely to report feeling unrested after a night’s sleep than non-smokers. The study involved the analysis of the sleep architecture of 40 smokers and a matched group of 40 nonsmokers who all undertook home polysomnography. It also suggested that smokers spend less time in deep sleep than non-smokers. Or the absence of it, to make this particular heading more accurate! This is simply because hair grows from sac-like structures called follicles found underneath the scalp. These follicles require oxygen and essential nutrients and vitamins/minerals in order to function correctly and trigger natural hair growth. Smoking reduces the amount of oxygen and nutrients that get to your skin and the results are basically unconcealable. Follicles not functioning as they should lead to a disruption of the normal hair growth and loss cycle. And in turn, this causes hair thinning and eventual hair loss. If you’re a smoker or live with a smoker, it would be great to hear your views!